thoughts on what is driving improvement? are the veterans getting better, or has a new crop of younger guns entered the picture? I think it is just the higher professionalism of kicking overall, together with some improvements in Technique und material. Thats combined with a slow change in using pattern, which has coaches learning over the years that they could try longer and longer field goals and kicker learning the appropriate technique to make them. Which the league would do something, because it further increases the randomness of endgames. Hard to say why, it's just a human progression thing. Back in 1984, the 100m mens gold medal was won in a time of 9.99s. This year, a 9.99 would only have beaten Asafa Powell, who pulled up injured. It's just the way sports performance is evolving and continues to evolve. If we were talking about baseball (or cycling), we all know what our first suspicion would be. I have no evidence that the performance is based on PED usage, but the fact that no one raises the possibility is interesting. I think the NFL is getting better at finding guys who are great kickers, no matter where they went to school. I went to school with Greg Zuerlein, the Rams new kicker, at a D2 school (Nebraska-Omaha) and he was a stud ever since he started kicking. I'm not sure how he slipped through the cracks to end up a D2 kicker but obviously a lot of D1 teams would have loved to have him. Perhaps in the past it was easy to just draft the top college kickers (by reputation) and just let them do their thing assuming nothing was better out there... now maybe they are doing a better job of giving guys with great numbers (but not a great college career by attention) a chance? I wonder if there is a similar trend in college football where it seems every week the story is of a kicker who missed a FG they "should" have made. Perhaps this just shows the cream rising to the top. Brian - good point about PED but what I always find interesting about doping arguments is that all these players are basically taking PED, just ones that are declared by the governing body to be legal. Most of the nutrition and supplements taken by the players are only a board decision away from being illegal. Same with the 100m sprinters I brought up. Usain Bolt will have some cocktail to take that enables him to run at the speeds he does, it's just not one that's been classed illegal. Doping is, at its heart, a bureaucratic rather than a moral argument. Are there PEDs likely to improve accuracy? 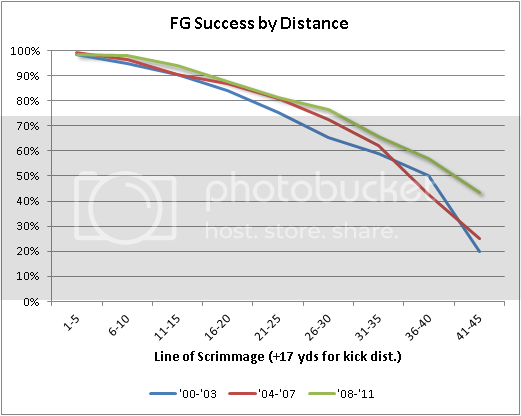 I'd think accuracy is likely to be the limiting factor rather than distance--we already see many kick-offs going through the end zone so that's more than 70 yards distance. Sam P - Having the ability to kick the ball farther could help accuracy in that kickers can use a less-than-full-power kick and focus more on maintaining proper mechanics. I know I hit golf balls much better when I take a nice easy swing. Are these more recent results weighted more heavily into your WP regressions than the older results, or should we expect WP to under-predict FG payoff? Ian, I thought almost all supplements were shown to have very little if any positive effect in scientific studies? There are innocent reasons for improved performance. A country with more people is likely to have their 30 best kickers and runners be better than one with fewer people. A country with more people and more disposable income is more likely to pay more to watch the top athletes, which means more athletes can invest more of their time into training. The performance of a country's top athletes should improve as long as the country's population and income grow. I suppose if kicker performance has improved more than the performance of other athletes, we'd still need to answer why. Did kicker salaries go up 10-15 years ago when the latest crop of kickers would have been making choices between a kicking career or a business career? 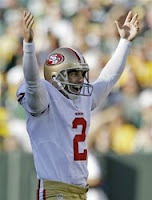 janokoski is the best kicker in the AFC.akers is the best kicker in the NFC.